The great weakness of the American political system is gridlock. It was baked in the cake by the Founding Fathers, who deliberately set up a system in which the White House, Senate and House of Representatives may be under separate party control. While this system worked tolerably well for more than 200 years, it was only because certain norms were followed that have now gone out the window. Consequently, gridlock has become a threat not only to our system of government, but also to our economy. In a parliamentary system, the chief executive will necessarily have working control of the legislature, although it usually involves a coalition of two or more parties. Importantly, however, parliamentary democracies separate the head of state and head of government functions that are combined in the American president. The head of state is often a monarch who stands above politics and fulfills the many purely ceremonial functions that consume so much of the president’s time and energy. This leaves the prime minister free to run the government mostly free of both ceremonial duties and legislative gridlock. In theory, the prime minister can always enact his program, although there may be considerable wrangling within the cabinet. He [the president] ought to be elected by the people at large, by the freeholders of the country. That difficulties attend this mode, he [Morris] admits. But they have been found superable in N.Y. & in Cont. [Europe] and would he [Morris] believed be found so, in the case of an executive for the U. States. If the people should elect, they will never fail to prefer some man of distinguished character, or services; some man, if he might so to speak, of continental reputation. If the legislature elect, it will be the work of intrigue, of cabal, and of faction: it will be like the election of a pope by a conclave of cardinals; real merit will rarely be the title to the appointment. Another important commentary on the rejection of a parliamentary system appears in Federalist Nos. 10 and 51, both written by Madison, in which he is highly critical of “factions.” This term essentially meant political parties, which is perhaps the key blind spot in the Constitution in terms of the American system of government. Of particular concern were parties that were largely, if not exclusively, sectional, which could eventually tear the country apart when a minority was unable to prevail on some important issue, such as slavery. Madison thought a strong president elected by all the people plus the diffusion of legislative power between the House and Senate would keep factionalism under control. And except for the Civil War, he was right. But recent events suggest that the federal government is suffering from factionalism that is severely debilitating. The core problem is that some in the Republican Party simply refuse to respect the legitimacy of Barack Obama’s election or any legislation they oppose, and have thrown out centuries of common practice to use filibusters, holds on nominations, government shutdowns and other scorched earth policies to get their way despite only holding a small majority in one house of Congress. The result has been gridlock that has hampered government’s ability to function, left important national needs unmet and is imposing heavy costs on the economy. In recent weeks, a number of corporate executives and economists have spoken out on the need to break gridlock and get the federal government working again. Among those who have condemned gridlock and political dysfunction are the money managers Laurence Fink of Blackrock and Andrew Law of Caxton Associates, and the economists Michael Spence, a Nobel Prize winner, and Mark Zandi of Moody’s. One point they make is that the failure of Congress to establish even a minimal degree of certainty on the budget and the debt limit has forced the Federal Reserve to maintain what many view as an excessively easy monetary policy. As the only agency of government with freedom of action, it is forced to pick up the slack for Congress’s failure. Political dysfunction is also rising sharply as a concern of voters that could have important electoral implications in 2014 and 2016. 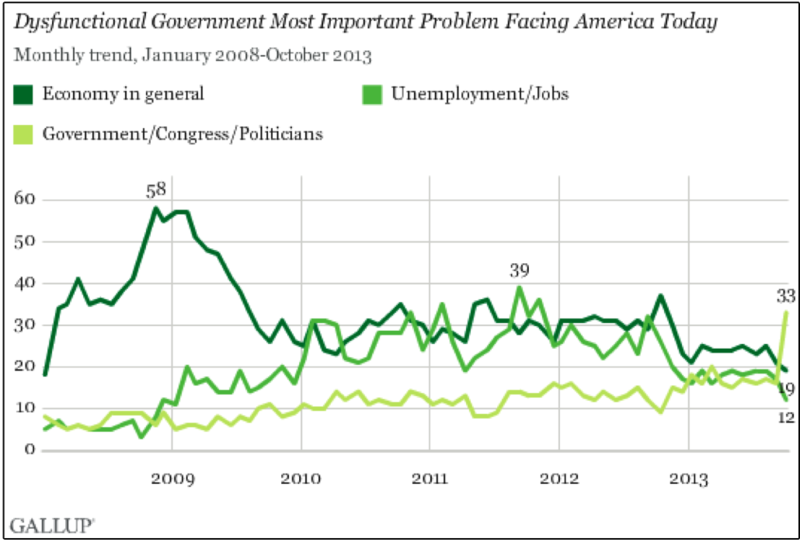 As an October 9 Gallup poll reports, political dysfunction now exceeds by far the economy and jobs as the principal concern of Americans. An NBC News/Wall Street Journal poll published on Wednesday shows rising dissatisfaction with Congress’s inability to get its act together. Seventy-four percent of people now say that Congress is contributing to the nation’s problems rather than fixing them, as it is supposed to do, with 43 percent blaming their own representative. Consequently, 63 percent of people now say that their representative should be replaced with someone new. This is the highest percentage ever recorded in the history of the poll and above that prior to the Republican takeover of Congress in 1994. This “throw the bums out” mentality presents a huge threat to Republican control of the House because every member is up for reelection, whereas the Democratically-controlled Senate has only a third of its seats in play next year. According to political handicapper Charlie Cook, Republican hopes of retaking the Senate are fading rapidly and many members of the class of 2016, elected in 2010, the peak year of influence for the right-wing Tea Party, are looking vulnerable. Obviously, an across-the-board anti-incumbent trend will hurt the majority party most and a switch of just 17 seats will change House control, which political handicapper Sam Wang thinks is clearly within reach for the Democrats. The New York Times reported yesterday that Democrats are doing a much better job than Republicans are of recruiting strong candidates for winnable seats next year. Moreover, many Republicans anticipating easy reelection in the general election face strong Tea Party challengers in the primaries. Such challengers have successfully knocked off incumbents such as Richard Lugar in Indiana and Robert Bennett of Utah and must be taken seriously even by Senate Minority Leader Mitch McConnell of Kentucky. It is too soon to predict that Democrats will retake the House, but voters seem more amenable to a de facto parliamentary system in which Democrats have complete control of government. They are tiring of Republican gridlock.